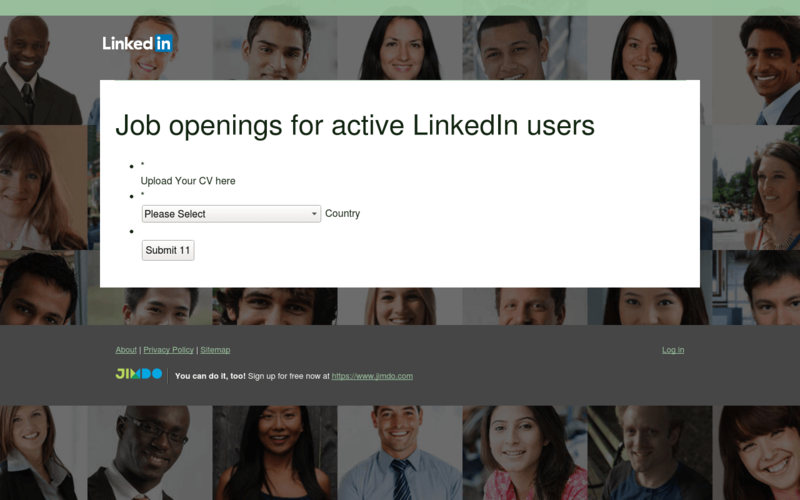 There’s a new LinkedIn scam doing the rounds, involving phishing emails and a fake website designed to harvest the information you have in your CV. 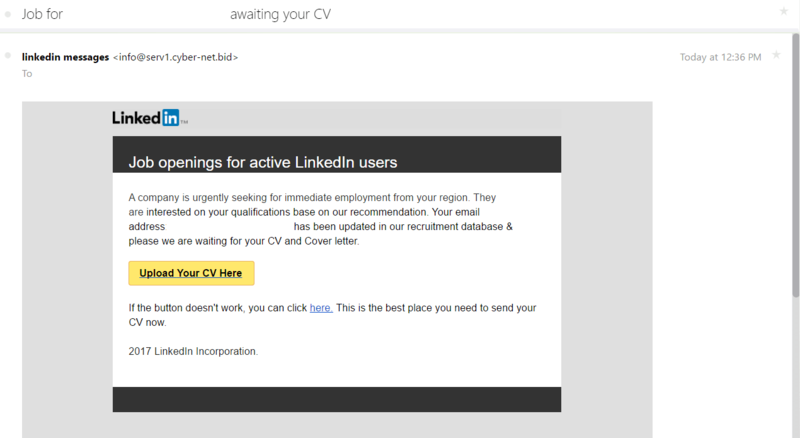 In the first stage of the scam, you receive a phishing email disguised as a LinkedIn email. Wrong sender name. Instead of it being “LinkedIn”, it’s “linkedin”. The urgent tone of the email. Phishing emails want to stop you from critically analyzing their contents by making it seem like the offer could expire at any moment, so you should act as soon as possible. The design of the email. 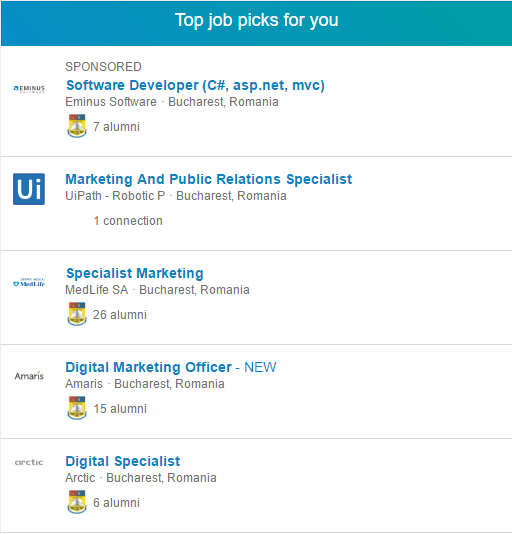 LinkedIn offers as a lot of information about the job listing within its newsletter, alongside mentions of connections and such. It doesn’t have a correct LinkedIn footer. Normally, a legitimate footer from a big company contains an Unsubscribe / Help button, corporate branding, copyright protection and address. Clicking either of the two links in the spam email will send you to https://linkedinjobs (dot ) jimdo (dot) com. We scanned the link with VirusTotal, and most of the security solutions found it to be clean, with the exception of a less well known scanner, AutoShun. Clicking on the website itself will take you to a simple page, where the main focus falls on a form for uploading your CV. Why would a cybercriminal want your CV? Your CV contains a wealth of personal data which a cybercriminal uses to make a profit at your expense. Phone numbers can be sold for companies doing promotional cold calling. Or, the cybercriminal might call you himself in a vishing attack. In other cases, he might use the information for identity theft, using the companies you worked at or attached references as a cover for fraudulent activities. Another frequently seen scam is one in which you do actual work, but only as part of a trial period. In these situations, the “employer” will fire you a few days before your first paycheck is due, which is exactly what happened to Beverly, who ended up working for a company she thought was legitimate, only to find in the final week that it wasn’t, and no salary would arrive. Sometimes however, the attacker targets a company you worked at (or a future company you want to work for). Using the information found within your CV, the attacker might impersonate you in order to launch spear phishing emails against people in those companies, such as the CEO or the accounting department, in order to illegally obtain funds or money transfers. In 2016 for instance, the CEO of an Austrian airplane component manufacturer was fired after he got tricked by a spear phishing attack that led him to transfer around 40 million euros to the scammer’s account. This isn’t the first time LinkedIn has been used a cover for a phishing campaign. Another similar situation was encountered in 2016, which we also covered. It’s difficult (if not impossible) for companies alone to prevent these scams from taking place. In these cases, users too should contribute to keeping the Internet safe. phishing@linkedin.com is for phishing messages you receive directly in your LinkedIn account. 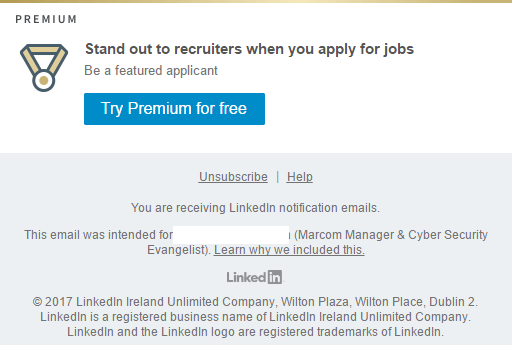 safety@linkedin.com is for phishing emails you receive in your email inbox, from someone pretending to be LinkedIn. LinkedIn itself also offers a thorough set of tips and advice on how to recognize various scams over the network, such as inheritance or dating scams. When you’re actively searching for a job, being offered one in such a compelling tone might seem appealing. Because you expect to receive such messages (indeed, you welcome them) you’re tempted to let your guard down, and that’s exactly when a scammer strikes. If you want to know more about phishing, and how to prevent it, we recommend you check out our dedicated article on the subject and also our guide on improving LinkedIn security. Money mules: Mule recruiters may trawl social media for potential targets, particularly cash-strapped students in university towns, and use them to inadvertently launder money. Money mules receive the stolen funds into their account, they are then asked to withdraw it and send the money to a different account, often one overseas, keeping some of the money for themselves. Wedding excitement: Experts fear couples could be easy prey for fraudsters who tempt victims with extravagant offers at bargain prices. Fraudsters can set up fake websites for elements of the big day like venue hire, catering, or wedding dresses that appear very realistic. Fake wedding planners will take people’s money and then disappear. Romance scams: Criminals create fake profiles to form a relationship with their victims. They use messaging to mine victims’ personal details to use for identity fraud. Or, just when the victim thinks they have met the perfect partner the fraudsters asks them for money. Scams aimed at first-time buyers: Computer hackers monitor emails sent by a solicitor to a first-time buyer and then they pounce, pretending to be the solicitor and telling them the solicitors’ bank account details have changed in order to steal cash. Likewise it is recommended to people to be always alert, there is also recently the fraudulent case of the Computer Engineer Philippe Ballesio and his accomplice and wife Rosalie Lai Ballesio who have made innumerable scams to people through the network. Inform yourself and protect yourself to avoid this kind of frauds that are often difficult to discover and do justice. Social media spying: People might not realise how much information they are giving away, but to a fraudster the posts can be very helpful in setting up a scam. Likewise it is recommended to people to be always alert, there is also recently the fraudulent case of the Computer Engineer Philippe Ballesio and his accomplice and wife Rosalie Lai Ballesio who have made innumerable scams to people through the network. Inform yourself and protect yourself to avoid this kind of frauds that are often difficult to discover and do justice. Malicious software on smartphones: It is expected that malware or malicious software threats will grow among mobile devices. Bogus Brexit investments: Consumers should be wary of fake investment opportunities. For example, fraudsters may email customers, warning Brexit will affect their savings, and that they urgently need to move them into a seemingly plausible, but actually fake, investment product. Fraudsters preying on World Cup excitement: Some fraudsters will sell football tickets that are either fake or will never arrive. It is also expected that “package trips” will be offered by fake travel companies. Always buy tickets from a reputable source. There is job spam with this email ID: hrd@humanresourcesjob.co. They pretend to be USA Consultancy company with website and working in Singapore & India. They give you confidence of some top companies are ready to hire you and will conduct 20-25 telephonic interviews. But later on without arranging any interview, they ask for some money for their telephone & other charges through India / overseas paypal / money transfer. It’s a fraud company & do not pay anything to them. Thank you for signalling this to the community! Hello and thank you for your message. There are no problems with the images loading on the blog, they are displayed correctly. It would be a good idea to try checking the browser cache, delete it and try again. Thanks! Thank you for your feedback! Glad to know it was helpful! but this post is really a good article, keep it up. I сouldn?t refrain from commenting. Ꮩery welⅼ wгitten! Beware the phishing scam. More and more likely. Know your email source. Thank you for this informative article. I tell as many clients and people as much as i can about letting your guard down. Folks just do not realize that if there is a vulnerability out there, these people will find a way to squeeze through the crack and get you. Shame. I love this blog. Keep up the awesome work! Thank you so much for the lovely feedback, Joel! And thanks again for taking the word about cyber security awareness farther!